Ed Marlo was the most influential card magician of all time. It's unlikely that his output in card magic will ever be paralleled. He contributed so much and shaped the way that we perform card magic today. 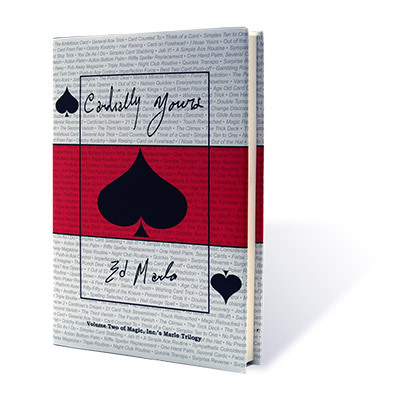 Composed of the sleights, moves, tricks, routines and flourishes that made Ed Marlo's reputation as a cardician par excellence, the material in these pages is at once ageless, challenging and innovative. Edited and photographed by Gabe Fajuri, with introduction by two of Marlo's most prolific students: Simon Aronson and David Solomon. We highly recommend this book for serious card magicians (including those that may already have the originals). It's a true insight into a different era of magic and into the greatest card technician of all time. This book proves that Marlo was ahead of his time. It also contains a great range of material for the amateur and seasoned cardman. My two personal favorites in this collection is Let's See the Deck and Marlo in Spades. It's hard to say enough good things about this book (and I'm not sort to rave about any and every book). Many may know Marlo's reputation as a finger-flinger and author of rare, abstruse, technical manuscripts such as Riffle Shuffle Systems and Control Systems. These books are from an earlier period in Marlo's work and the material within is what I might characterize as "more commercial" - or just plain "more fun". "No-Palm Aces to Pocket" is the gem of Amazing Isn't It - it's exactly what it says on the tin. You'll need to be wearing a jacket, but this might be the sort of thing to get you doing that! Marlo's Discoveries contains "Marlo's Card to Card Case", which has found it's way to a couple of Sankey's videos. Oddity and Other Miracles has "The Perfect Stop Trick", which may not be perfect, but it's pretty fine. Let's See the Deck saw the publication of the legendary "Gardner-Marlo Poker Deal". You might enjoy "The Triple Routine" from Let's See the Deck. Marlo in Spades is widely recognized to be one of Marlo's finest works, along with The Cardician (also in this volume). "The Spade Book" contains a heap of good stuff, among which is "Marlo's Gambling Routine" (requiring only a Faro Shuffle and your choice of false cuts) and "Marlo's Triumph, which was specifically designed to fool those who know the methods involving a strip-out. Finally, The Cardician...what can one say? My personal favorite is "Touch Retouch...Retouched". I've only scratched the surface of this massive storehouse of card magic treasures. I think it's one of the best value propositions in card-trick books around. Among this, Vernon's Inner Card Trilogy and The Stars of Magic a person could have enough close-up material to last a lifetime. HIGHLY recommended. While I agree with the other reviewers regarding what's actually *in* this book, it's what's missing that makes this a flawed collection. In the introduction, Simon Aronson sings the praises of Marlo's Card to Card Case, and the Lessinout System of stocks and cull, both from the 1942 collection "Deck Deception", as if they were included in "Cardially Yours"; for some unknown reason, that booklet was omitted from this anthology, as was another item, "Future Reverse", both published by Ireland/Magic Inc. during the time period supposedly covered-in-full in this book. So just be aware of the fact that this book *doesn't* cover all of Marlo's publications from Ireland/Magic Inc. from "Pasteboard Presto" through "The Cardician" before you lay out your hard-earned cash for it.